I'm not a beginner - do you have more advanced courses? How do I view my account details and sales history? Why can’t I record my voice? Can I download my course materials? Why can’t I hear any audio in the lesson? What language courses do you offer? You can compare these to Beginners, Intermediate, and Advanced respectively. Each level is an independent course and doesn't contain material from the previous level. There are also the more advanced Travelogue series in Spanish, French, Italian and Russian. Rocket Arabic, Hindi, Inglés, Korean, Portuguese, Russian and American Sign Language only have 1 level. All free trials include lessons from the Premium (Level 1) level of the course and so will give you an idea of how the course works and the kinds of topics covered. For those languages with more than one level, we have also included more advanced samples - just look for the Level 2 & 3 in the left hand side bar on your Members Area page. Our courses cost USD $149.95 for online lifetime access. The Rocket Sign Language course and the Rocket English course cost USD $99.95 each, as they are a different format. What is in a typical Rocket Languages course? The main components of all Rocket Languages courses are the Interactive Audio lessons & the Language and Culture lessons. These give you a balanced approach to learning each language. The courses also include lots of features that help you with your learning; like adding notes on lessons, earning points, saving words in My Vocab, and practicing your pronunciation with Rocket Record, our voice recognition technology. The Flashcards are a great way to have fun while learning as well. You will be able to track your progress within your online members area and rate lessons using our rating system - "Hear It, Say It", "Know It", "Write It" and "Play It". *Please note that Rocket Sign Language and Rocket English do not follow the same format. While our lessons are designed to be used online via a desktop computer, or on a smart device via the Android or iOS app, the lessons can be downloaded as a PDF to your computer. Similarly, all of the Interactive Audio lessons can be downloaded and copied to an iPod/MP3 player/smartphone for listening to away from your computer. Please note that for the best learning experience we recommend using the lessons online, so that you can use tools, such as the quizzes, Rocket Record, My Vocab, My Notes and progress tracking. What are the file sizes of the downloads? The 30 or so Interactive Audio lessons are available for download individually as MP3 files. They range in size depending on the length of the lesson but are not larger than 30MB each. The Language and Culture lessons can be downloaded as small PDF files. Can I try the course before buying it? The trial will give you a preview of the course itself and you will be able to sample actual lessons from the course. Our courses also come with a 60 day money back guarantee so if you change your mind later on, just contact us for a full refund - no questions asked! When you purchase a Rocket Languages course, there is no time limit applied to accessing your Members Download Area. Even if you purchase now and don't download anything for 6 months or even 6 years, you will still have full access. This includes any changes and improvements that we make to the course. Do you offer discounts or licensing options for schools or non-profits? Do you offer discounts or licensing options for businesses? Enter your email address and password to gain access to your course. If you can't recall your password, please click "Lost your password?" and we will send you a reset password email (check your spam or junk folder if it doesn't arrive within a few minutes). If you have any problems with this, just contact us with your Clickbank receipt number or any other email addresses you might have used when ordering or signing up to a free Trial. You can view all your account details and sales history in your Members Area. Please log into your account as normal and then click on your name in the top right hand corner. You can update your password and email address here. If you have purchased using PayPal, please ensure you are logging in using the email address associated with your PayPal account. If you are still having problems logging in, please contact our support team here and include your Clickbank receipt number. I bought a Rocket Languages course a long time ago. Do I still have access? If you can't recall your password, please click on the "Lost your password?" link. If you are still having problems logging in, please contact our support team here and include your receipt number if possible. 2. Select the language you wish to learn. 3. Select a package and click the Buy Now button. 4. On the payment page, enter your billing information, then click "Pay Now". After placing your order, you will be re-directed straight to the Rocket Languages members area and will be asked to create a password if you don't have one already. You should also receive your login details & Clickbank receipt by email. Why doesn't the order form work? Clickbank (our payment processor) does go offline temporarily from time to time (like most web sites), while this can be very annoying usually it is only very temporary and within 15 minutes or so it will be back online. If you find that the Clickbank order form is not working after 30 minutes or so then please email us here and we will try to contact Clickbank. All special prices will be honored as long as we get an email from you! If your order went through, you should have received a receipt from Clickbank (our payment processor). You should also have been re-directed to the Members Area right after you ordered. If you're still not sure, you can look at your credit card statement to double check. You should have a charge from Clickbank. If you haven't received your login details or welcome email, please check your spam or junk mail folder. Please contact us here if you have ordered but have not received your receipt number. Did I order more than once? If you have mistakenly ordered the same package more than once you would have received more than one email from Clickbank (our payment processor), with the product description being the same on both receipts. If you have ordered the same package more than once then please email us straight away so that we can refund the mistaken purchase. Please note that if you have taken advantage of any of our upgrade offers, you will be sent two emails with different receipt numbers. Please check the product descriptions listed on the receipts to determine whether you have ordered two different packages, or whether you have mistakenly ordered two copies of the same package. Can I give a Rocket Languages course as a gift? You will be emailed a voucher which you can email to the recipient or print out. If you have already purchased the course under your own name, don't worry! You can update the account details with the recipient's name and email address later on. If you have any problems with this, contact our support team here. Can I pay from outside the United States? However, please note Clickbank (our payment processor) has some automated security features when it comes to credit card transactions, especially with overseas credit cards. For instance, if the country of origin of the credit card and the country where the Rocket Languages product is being ordered from are different then it is likely that the transaction will be denied. We would recommend trying it and seeing what happens! If you are unable to do it then please contact us. Yes. We value your privacy so we use Clickbank as Rocket Languages’ payment processor. Your information is 100% secure as Clickbank is one of the most trusted and largest payment processors on the internet, processing thousands of orders for thousands of publishers, like Rocket Languages, every day. In order to process payments with Visa and MasterCard credit cards, Clickbank requires the CVV2 or CVC2 validation code. Most cards have this 3-digit code printed on the back of the card, to the right of the card number. American Express cards have a 4-digit code printed on the front, to the right of the card number. If you are 100% certain your card has no code on it, enter "none" in the blank. Clickbank (our payment processor) has some automated security features when it comes to credit card transactions, especially with overseas credit cards. For instance, if the country of origin of the credit card and the country where the Rocket Languages product is being ordered from are different then it is likely that the transaction will be denied. Please contact us if your order is declined for this reason. I don’t have a credit card. How do I buy the course? Please note that the rates listed on the currency conversion site are wholesale prices, which means that they don't include fees etc. If you're not happy with your course we can issue a full refund for you as long as it is within 60 days of purchase. Just contact us here. Can I buy the individual levels? Rocket Spanish, French, German, Italian, Japanese and Chinese have three levels. To order level 2 or level 3 of these languages please go to the pricing page https://www.rocketlanguages.com/pricing.php, select your language, then scroll to the bottom of the page and look for the heading "Can I buy the individual levels?" Click on the level you wish to purchase. - We officially support the current and prior major releases of Chrome, Firefox, Edge, Internet Explorer and Safari on a rolling basis. - In order to get the best out of your course, we recommend using an updated version of the Chrome browser. True voice recognition is only available for Chrome users. - Firefox, Edge & Safari 11 will be able to record audio without pronunciation feedback. - All other browsers can only play the tutor’s audio. - Android - look for our App in Google Play Store! - iOS (iPad, iPhone, iPod Touch) - find our app in the Apple Store! * Note: Certain features will not work on mobile devices. If you have any concerns, please email us. What does the 2019 Edition of my course include? If you have any questions, please let the Customer Support team know . Why should I use Google Chrome? Our new version of Rocket Record will work best for Chrome users, as this is the only browser that is advanced enough for our new voice recognition feature. The other browsers are catching up, but aren't quite there yet. Please ensure you have the *latest* version of Chrome installed (check here). Firefox & Edge will be able to record audio without pronunciation feedback (so similar to the previous version but without the need for Flash Player). All other browsers, including Safari and Internet Explorer, can only play the tutor’s audio. First, check your microphone is plugged in correctly and that it is being detected. You will need to allow access to your microphone and ensure the correct microphone is selected from the drop-down list. We recommend using a headset over an inbuilt microphone. Also make sure that you have the *latest* version of Chrome (check here). For Edge users, your browser will select your system’s default microphone. 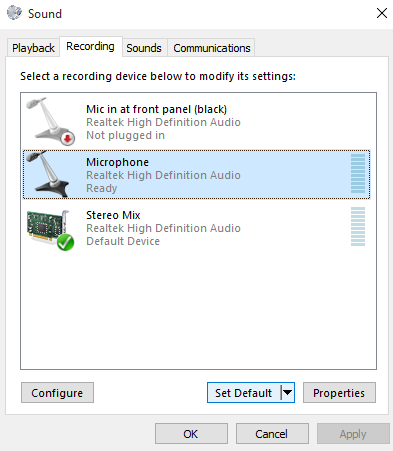 If you need to change this, you can visit your sound settings by right-clicking on the microphone icon in your taskbar and choosing “Recording devices”. Select your preferred microphone and set it as default. *Please note that true voice recognition is only available for Chrome users. Firefox & Edge will be able to record audio without pronunciation feedback. All other browsers including Internet Explorer and Safari can only play the tutor’s audio. Don’t forget that the app is a great alternative to record your voice! Just search for “Rocket Languages” in the app store (iOS or Android) to learn on your mobile device. Let the Customer Support team know if you have any further questions. Why do I keep getting bad or inconsistent ratings in Chrome? Rocket Record’s voice recognition is designed to detect a "native" accent so try and mimic your tutor as closely as possible for best results. If the system is consistently rating you badly or if your ratings are inconsistent, it may just be a case of positioning your microphone differently so that your breathing doesn't interfere with your recording (e.g. near the chin, not too close to the mouth). Also make sure that you have the *latest* version of Chrome (check here). Importantly, we recommend using a headset microphone, as this will give you a better quality of recording and therefore more accurate results. Why do the volume levels keep changing randomly? When you play & record audio in the course, Windows may dim the volume as it detects communication activity. You can change this in your Windows settings. - In your Start menu, search the Settings category for "Change Sound Card Settings". - In the "Communications" tab, change "When Windows detects communications activity" to "Do nothing". Why is Rocket Record cutting my recording off early? How do I use Play It? Play It! really gets you thinking on the spot by letting you take part in an actual conversation. IMPORTANT! We recommend using a headset for best functionality! Test how well you know the conversation from the Interactive Audio lesson. - Select the speaker you want to be and the difficulty level. Once you have completed each difficulty level you will get an overall Rating, which will be reflected on the Dashboard. Hotkeys are keyboard shortcuts that help speed up the process of going through various functions on your desktop/laptop browser. These hotkeys will also work on the Module and Final Tests. Can I increase the font size? If you have trouble reading the course content, most common browsers allow you to zoom. Zooming will enlarge the screen and make the content easier to see. To zoom your screen hold down the Control key (or Command on a Mac) on your keyboard and press the + or - button. To return your screen to normal size, hold down the Control key (or Command on a Mac) and press the number 0. Alternatively, for Google Chrome users there's a free Screen Reader extension called ChromeVox, which will speak aloud the words on the screen. How do I use native script in Write It? Depending on what language you're studying, you may need to use the provided virtual keyboard (to the right of where you enter your answers) where you can find native script and special characters. Use "Alt" or tick the check box to see other character options. If the letter you need isn't already accented, make sure you tick the check box, choose the highlighted accent and select the letter. You can also use Google Input Tools (http://www.google.com/inputtools/) - available for Google services, Chrome, Android devices, and Windows. If you use Firefox you can search for native keyboard extensions as well. Why won't the file I downloaded open? Please try re-downloading the file. Most often the file simply didn't download correctly. Anti-virus software, pop-up blockers, and firewalls can also prevent a file from being fully downloaded. To resolve this issue, close all other open applications and re-download the file using a different internet browser. We recommend using Chrome (http://www.google.com/chrome) or Firefox (http://getfirefox.com). If you are still having problems even with a different browser, please email our support team here with more details and include a screenshot of the problem if possible. Where are the files I downloaded? Files normally download to a default folder (e.g. Downloads) depending on your internet browser settings. Please check your browser settings to find where your files are being saved. You can also check your recent download history in your internet browser or download manager. If you can't find the file you downloaded, you can try downloading it again and taking note of where it will download to. We are always trying our best to make sure that our course materials are up-to-date and working properly. If you come across any errors or mistakes, contact us here with more details or use the Help & Support link at the top of the page. Can I use the course on my iPad, iPhone, smartphone or tablet? You sure can! We have a free app for both Android and iOS devices. Search for Rocket Languages in the iTunes Store or Play Store. Why can’t I see foreign characters/scripts? For the Rocket Chinese, Rocket Korean, Rocket Japanese, Rocket Hindi, Rocket Arabic and Rocket Eigo courses you will need to make sure that your browser is set to display the non-English scripts. Otherwise these characters will show up as small boxes or symbols. Mozilla Firefox & Google Chrome browsers normally display these automatically but if you are using Internet Explorer, please go to “Page” in your toolbar and under “Encoding”, make sure that it is set to “Unicode (UTF-8)”. Please check that your browser is up to date. If you have an older browser please check for updates or install Chrome (google.com/chrome) or Firefox (getfirefox.com) to be automatically updated to the latest versions. In order to get the best out of your course, we recommend using an updated version of the Chrome browser. True voice recognition is only available for Chrome users. Firefox & Edge will be able to record audio without pronunciation feedback. All other browsers can only play the tutor’s audio. How do I download the Interactive Audio lessons? To download any of the files for Rocket Languages, right click on the link that says "Download Audio" and select Save Target As or Save Link As. If you are on a Mac, hold down the Control Key and click on the download link to replicate the right click function. After the Save Target As or Save Link As option is clicked, another window will appear asking where you would like to save the file. Navigate to where you would like to save the file on your computer and then click the "Save" button in this window to commence the download. Please ensure that you take note of what location the files will be saved to so that you can easily locate them again. Once your download has completed, you will be able to play the lesson using Windows Media Player or iTunes. Can I download the Interactive Audio lessons? The audio lessons can be downloaded to your computer or used offline on your smartphone. On a computer you will need to have Windows Media Player or iTunes installed on your computer in order to play the audio lessons. Please note that the Rocket Languages courses can only be downloaded for your own personal and private use as per our Terms and Conditions. Can I get my course on CDs? Unfortunately we no longer offer the course on CDs. If you need to use the lessons offline, you can download the audio and PDF files to listen to/read offline. Please note that you will still need to be online to access some features like the flashcards, Rocket Record, My Vocab and progress tracking. There are many ways to earn points in your course. Can I sign up for free language lessons? Yes! If you subscribe to any of our free trials, we will set you up with your very own Members Area and will give you free access to some of the lessons included in the full course, so you can try them out. You will also be able to see the topics covered in the rest of the course. For those languages with more than one level, we have also included samples of these more advanced lessons - just look for the extra tabs across the top of your Members Area. You will also receive free weekly newsletters which you can unsubscribe from at any time. To sign up for a free trial, visit our home page HERE and select a language. You can also find other Free Language Resources here. How do I access my free trial? If you can't recall your password, please use the "Lost your password?" link to reset it. If you are still having problems, contact our support team here. The Rocket Fuel emails are dynamic, weekly newsletters that are full of hints, tips, and info to make your learning journey easier and more fun. Each one is individually tailored, based on up-to-the-minute information about which lessons you've completed already, and how well you've done. The lessons you find in your weekly Rocket Fuel emails are suggested from your existing members area so just click on them to be taken straight there. Are my details safe? Will you sell my email address? We will NEVER pass your email address on to spammers! Over half of the emails that Rocket Languages get are spam, and it is extremely annoying and frustrating, so there is absolutely no way that we are going to contribute to their cause. You can unsubscribe from our emails at any time by clicking on the "Click here to manage your subscriptions" link at the bottom of any newsletter or promotional email. Yes! Search for Rocket Languages in the App Store. Yes! Search for Rocket Languages in the Play Store or click here. Are all the features available on the app? Most of the features are functional on the app, however some features are not compatible. We try to update the app periodically with new features and bug fixes but if you have any feedback, please feel free to email us with your comments. Please make sure you are spelling your details correctly - if possible choose to view your password as you key it in so you can see what you are typing. If you are sure your details are correct, try uninstalling the app and re-installing it. If that doesn't help, please contact our support team here. The app isn't working properly - what should I do? Please contact us with more details on your problem so we can fix it in the next update! Why does Rocket Languages not designate the gender or plurality of phrases throughout the course? Because it's important that the learner gets used to ambiguity when learning another language. It's about getting a feel for the language and its structures rather than having definitive rules for everything (as often there aren't definitive rules, and there's usually always more than one way to say the same thing). Our main concern has been to make the translations as literal as we could without sounding awkward in English. In saying that, if you feel that a particular phrase could be made more literal or would benefit from being notated with regards gender or plurality then please let us know and we will consider it. Is Chinese a tonal language?